Longleaf Pine Straw Mulch at Mountain Creek Tree Farm Located in Concord, Ohio. 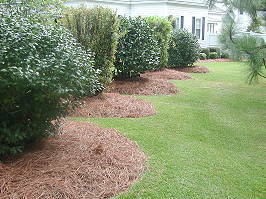 Pine Straw is excellent landscaping mulch for either residential or commercial properties. Longleaf is the preferred straw, as its higher resin content makes it retain its bright color longer than other varieties. 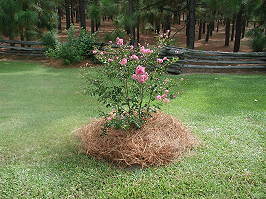 Pine Straw does not harbor termites or artillery fungus, and it preserves soil moisture. The interlocking nature of the needles of longleaf straw makes it excellent for erosion control on hillsides. Our straw is hand raked and baled for the best possible quality. 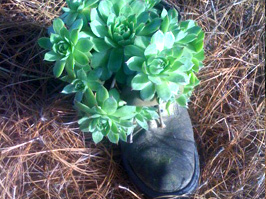 It is less expensive per square foot than wood mulches, and no trees are destroyed in Pine Straw production. The one precaution we recommend is to avoid placing Pine Straw in contact with a building constructed of flammable siding to minimize the fire hazard. This precaution should also be taken when using shredded wood mulch or any flammable mulch material. Longleaf Pine Straw - (14 Inch Pine Needle - a.k.a. - Long Needle Pine Straw, Pinus Palustris ) - The thickest needle with the heaviest wax coating resulting in extreme durability. Very few companies actually carry this premium product due to the fact that it's scarce. This is the only product that we carry due to its superior qualities. Slash Pine Straw - (9 Inch Pine Needle - a.k.a. - Slash Pine, Pinus Elliottii ) - The most common type sold on the market. Loblolly Pine Straw - (6 Inch Pine Needle - a.k.a. - Short Needle Pine Straw, Pinus Taeda ) - The worst of the three major types of pine needles, we will not carry the Loblolly Pine Straw due to the poor quality of the product and the fact that it does not last very long. 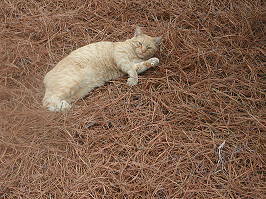 If you are looking at purchasing Pine Straw and the price is too good to be true, there is a reason. A lot of the copy cat web sites sell Loblolly Pine Straw because it's the only type they can get due to their geographical location in the U.S. If a company or web site does not list the type of Pine Straw they are selling, there is a good chance that it's because it is Loblolly. Companies will substitute cheap Loblolly Pine Straw and try to pass it off as Slash Pine Straw, or make a list of reason why it's "almost" as good as the other types of Pine Straw. Companies that do this will often try to get the customer to focus on the weight of the product to say you are getting more Pine Straw and avoid talking about the lifespan and quality of Loblolly Pine Straw. A dirty product loaded with sand, sticks, excessive moisture, and other types of debris will weigh more than a fresh, clean batch of Premium Longleaf Pine Straw. The Longleaf Pine (Pinus palustris) is a pine native to the Southeastern United States, found along the coastal plain from eastern Texas to southeast Virginia extending into northern and central Florida and historically covering approximately 90 million acres. Longleaf typically reaches a height of 100-115 ft although some trees have reportedly grown to as much as 155 ft. The bark is thick, reddish-brown, and scaly. The leaves are dark green, needle-like, and occur in bundles of three. They are often twisted and extraordinarily long usually ranging from 8-18 inches in length. Longleaf Pine takes 100 to 150 years to become full size and can live to 500 years old. When young, they grow a long taproot, which is usually 6-10 ft long; by maturity they have a wide spreading lateral root system with several deep 'sinker' roots. Longleaf grows on well-drained, usually sandy soil, often in pure stands. The longleaf pine was the dominant tree species associated with the southern pine ecosystem. In fact, the longleaf pine–wiregrass forest may well be the most diverse North American ecosystem north of the tropics, containing rare plants and animals not found anywhere else. The understory throughout the longleaf range contains from 150 to 300 species of groundcover plants per acre, more breeding birds than any other southeastern forest type, about 60 percent of the amphibian and reptile species found in the Southeast—many of which are endemic to the longleaf forest—and at least 122 endangered or threatened plant species. The longleaf ecosystem figured prominently in the cultural and economic development of the South. Today, these forests and landscapes represent significant components of the region's ecological diversity and offer new economic opportunities for many private landowners they also provide essential habitat for many rare animals and plants.